If any subject has the potential to attract the interest of the general public then there can be no better example than that of obesity. The news we often get is confusing and in most cases accusatory. We might be said to have a sedentary lifestyle, bad diet, lack of exercise, to many yo-yo diets or even a genetic predisposition to increased weight gain. Over and over again we hear the same things and often it seems we can do little right. Yet there can be no doubt about one thing: people in the twenty first century are getting larger and in many cases this is negatively impacting health. More recently we hear that in addition to any genetic predispositions we might have, the problem could lie closer to home in that the human body is simply fighting a losing battle when it is bombarded with compounds which adversely affect the metabolism. This, we are told, might make it virtually impossible for many people to actually prevent weight gain no matter what they do. So, with that in mind, many of you might be interested to hear that research strongly indicates supplementing with Royal Jelly may well help in restoring symbiotic metabolism and preventing excessive adipose tissue (white fat) accumulation. Western research involving Royal Jelly and excessive weight gain has only been undertaken in the last few years despite traditional Chinese medicine proclaiming this and many other benefits, for centuries. It began with a study undertaken in 2012 where the effects of Royal Jelly on body weight were measured in women suffering Type 2 diabetes (1). Interestingly the research revealed that patients supplementing with 1000 mgs per day of Royal Jelly were discovered to have a significant decrease in weight while there was a slight or insignificant increase in weight for those women taking a placebo. It would seem then that, in female patients suffering Type 2 diabetes at least, Royal Jelly may well be effective in helping them manage any metabolic weight increases. Of course, the results from this study opened up the question as to whether Royal Jelly would help others who have difficulty in managing their weight and a further study was undertaken and released in 2017 (2). This research looked into the benefits not specifically related to patients suffering from diabetes, but weight gain in general where it was related to either diet or metabolic dysfunction. Even though it was performed on mice rather than people, the results proved to be very encouraging not only in reducing weight gain but, quite possibly, in preventing it accumulating in the first place. The research evaluated the effects on both white adipose tissue (white fat) and brown adipose tissue (brown fat). Brown fat differs from white fat in that it contains iron and is necessary for the body to generate heat. Most often it is made from muscle tissue although it is possible, through exercise, to convert white fat into brown fat. What the study discovered was that when a Royal Jelly supplement was included even in a high fat diet fed to mice it suppressed the accumulation of white adipose tissue - the bad fat, whilst simultaneously not reducing the amount of brown adipose tissue - the good fat. In short, Royal Jelly would seem to target bad fat accumulation which is exactly what is needed when it comes to controlling weight without affecting energy levels and other metabolic functions. In another study, scientists recently set out to determine if a special compound found in Royal Jelly has the ability to induce thermogenesis. Thermogenesis is a safe and natural process that goes on inside your body all of the time. For example, green tea induces thermogenesis as well as certain compounds in cayenne and coffee. This is very exciting because increased thermogenesis is very important in boosting metabolism and burning body fat. All of the common 'fat burner' products on the market work through this same mechanism. What the scientists set out to determine was whether the compounds HDAA and HDEA, both found in royal jelly, could activate special proteins in human cells. By activating these proteins, the heat burning process that leads to increased fat burning I described above is increased. When the scientists measured how much the Royal Jelly compounds increased the special proteins that boost metabolism, they found huge increases! Now, this is not to say that royal jelly is going to return you to the body that you had when you were 19 overnight, but it is very promising. It also supports some of the observations I've made over the years in royal jelly users. Many of them have reported a very nice side effect - they seemed to find losing body fat easier while consuming royal jelly on a regular basis. 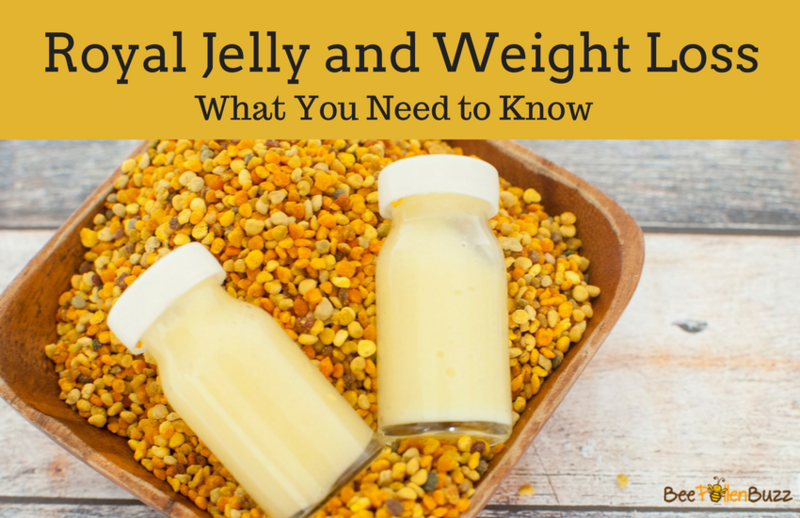 There is, of course, much work yet to be done, but the good news is that all three of these research studies indicate Royal Jelly is effective not only in helping to reduce excessive weight gain, but also that it may help avoid it in the first place. 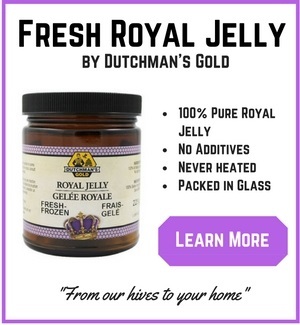 The study made no reference as to how much royal jelly it took to induce this increased rate of thermogenesis, nor could it as it was done in a test tube and not in living humans. I would suggest, based on past experience and the dose of royal jelly that has a therapeutic effect for other conditions, that one would need to take several grams of royal jelly per day to obtain a weight loss affect (3000 - 5000 mg's per day). And of course, eating a diet comprised of lean proteins and fresh fruits and vegetables while avoiding sugar and refined carbohydrates/grains along with it will assist in the fat burning process.